Mutussam Abu Karsh, 16, and Yasmeen Najjar, 17, were the first two Arab amputees to reach the summit of Mt. 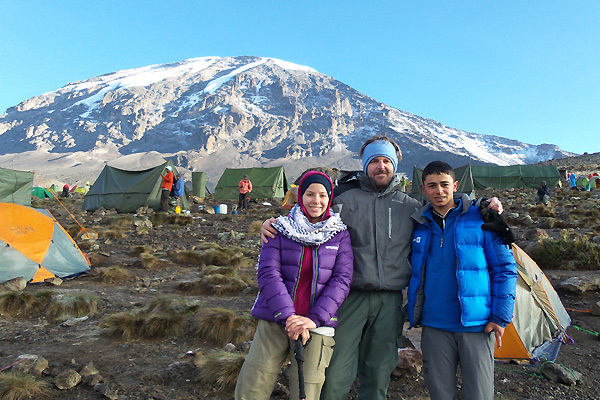 Kilimanjaro to raise money to treat injured Syrian children and inspire young people all over the region, that they too can do whatever they set their minds to. On January 23, two Palestinian teenagers who lost their legs, as innocent victims of the continued Arab Israeli violence,made history by achieving a gruelling trek up Africa’s tallest mountain in only eight days. It was a real challenge to brave extreme weather conditions and to reach the 5,895 meters high Uhuru Peak, which in Swahili means freedom. Even though the teens were in good health,they had to train hard to prepare their bodies to face unique challenges due to their amputation..
Yasmeen was struck by a car and her leg was run over at the age of 3 while she was playing outside her home in the West Bank village of Bureen near Nablus in the Northern West Bank. Due to the fact that she had to go through numerous checkpoints to reach the nearest hospital, it was too late for doctors to treat her and they were forced to amputate her above the knee. She was treated in 2005 by the PCRF in Houston, Texas (USA) and again in Dubai and Jerusalem, respectively. Mutussam lost his left leg and many fingers on his left hand in 2006 when an Israeli tank shell hit near him while playing soccer in northern Gaza. He was treated by the PCRF in 2007 in Los Angeles and again in Dubai in 2011. 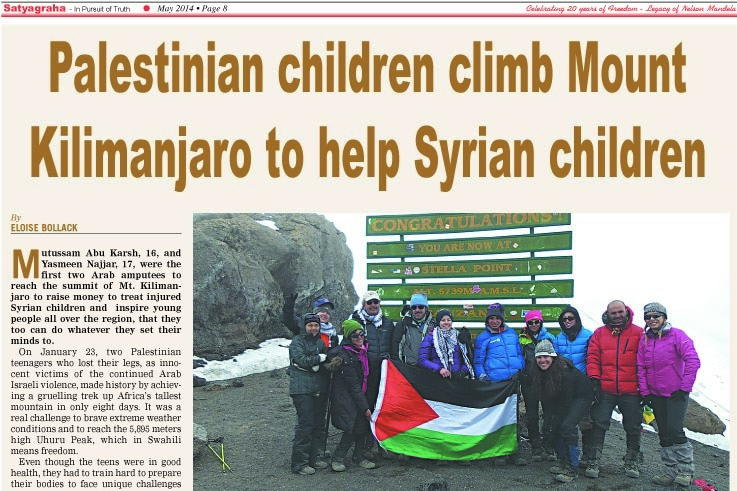 Mutussam adds: “I am proud we were the first to carry the Palestinian flag to the summit of Mount Kilimanjaro to help other children. It's the first time that I have felt truly free, no walls, no borders, no checkpoints and soldiers."